"Inter-state strategic competition, not terrorism, is now the primary concern in U.S. national security," the unclassified summary of the new strategy says. "Long-term strategic competitions with China and Russia are the principal priorities for the department, and require both increased and sustained investment, because of the magnitude of the threats they pose to U.S. security and prosperity today, and the potential for those threats to increase in the future." Defense Secretary Jim Mattis, in a speech releasing the strategy, called the new approach "fit for our time." Mattis said most of the strategy is being kept secret to better assist U.S. military forces that will be charged with carrying it out. The strategy is geared toward "providing the American people [with] the military required to protect our way of life, stand with our allies, and live up to our responsibility to pass intact to the next generation those freedoms that all of us enjoy here today," he told a gathering at the Johns Hopkins School of Advanced International Studies. American military forces are emerging from a period of "atrophy" that has resulted in the eroding of military advantages over adversaries, the 11-page strategy report says. The threat from China and Russia pose the most serious challenges. Both want to create a world "with their authoritarian model—gaining veto authority over other nations' economic, diplomatic, and security decisions," the report says. "China is a strategic competitor using predatory economics to intimidate its neighbors while militarizing features in the South China Sea," the strategy report states. Russia has used force to expand its boarders while coercing its neighbors and North Korea remains an "outlaw" state despite United Nations censure and sanctions. "Iran continues to sow violence and remains the most significant challenge to Middle East stability," the strategy says. Islamic State terrorists, despite the defeat of the so-called caliphate in Syria, continues to pose a threat with a long reach that will continue to threaten peace. The reemergence of strategic competitors along with the rapid spread of new technologies and new concepts of warfare require new military force structures to meet the threats. Military modernization is needed for both conventional and nuclear forces to maintain what the strategy calls "peace through strength," a concept first initiated in the 1980s by President Ronald Reagan. "Without sustained and predictable investment to restore readiness and modernize our military to make it fit for our time, we will rapidly lose our military advantage, resulting in a joint force that has legacy systems irrelevant to the defense of our people," the strategy states. Advances in military developments have ended America's unchallenged arms superiority when U.S. forces could be deployed with ease. "Today, every domain is contested—air, land, sea, space, and cyberspace," the report says. Foreign military forces have developed more lethal capabilities and are using methods such as information warfare to compete globally without resorted to armed conflict. "New technologies include advanced computing, ‘big data' analytics, artificial intelligence, autonomy, robotics, directed energy, hypersonics, and biotechnology—the very technologies that ensure we will be able to fight and win the wars of the future," the report said. Defending the U.S. homeland from attack is a main strategic objective and sustaining military forces is another major goal. Deterring adversaries and maintaining regional power balances in Asia, Europe, the Middle East, and the Western Hemisphere is another. To achieve those goals, the military will be "strategically predictable but operationally unpredictable," the report says. Key modernization priorities include upgrading nuclear forces, building up space and cyber forces, enhancing communications and intelligence capabilities, and strengthening missile defenses. For more agile forces, the Pentagon will improve military capabilities for fighting in air, sea, and space. Forces also will be restructured from large centralized groupings to smaller, dispersed, and adaptive basing that uses both active and passive defenses. Drones, artificial intelligence, and machine learning also will be new military priorities. On the information front, the military will seek to counter coercion and subversion used by revisionist powers and rogue states. "Some are particularly adept at exploiting their economic relationships with many of our security partners," the report said. "We will support U.S. interagency approaches and work by, with, and through our allies and partners to secure our interests and counteract this coercion." China used coercion against South Korea after Seoul agreed to deploy the U.S. THAAD missile defense system. China punished South Korean businesses in China, costing the South Koreans some $10 billion. The Pentagon also plans to foster a more competitive mindset. "To succeed in the emerging security environment, our department and joint force will have to out-think, out-maneuver, out-partner, and out-innovate revisionist powers, rogue regimes, terrorists, and other threat actors," the report says. "This strategy establishes my intent to pursue urgent change at significant scale," Mattis stated in the conclusion to the report. Mattis said during his speech that key investments will be made in new weapons and capabilities for space and cyberspace, nuclear forces, missile defenses, advanced autonomous systems, and agile logistics. Those elements "will provide our high-quality troops what they need to win," he said. Pentagon business practices that have resulted in large cost overruns and arms acquisition inefficiencies also will be improved, he said. Mattis recalled traveling by commercial jet to his nomination hearing last year thinking "how do I put ‘America first' into, in my mind, an alliance framework." "And, as we were getting ready to take off, you know what happened. You all can recite it from memory. The stewardess was standing there, and she said, ‘In the event we lose cabin pressure when the masks drop, put your own mask on first, then help others.'" 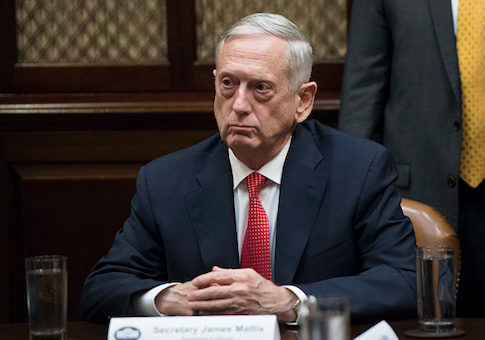 "So what we're going to do is restore America's economic viability, because no nation in history has maintained its military power that was not economically viable and did not keep its fiscal house in order," Mattis said. This entry was posted in National Security and tagged China, James Mattis, Pentagon, Russia. Bookmark the permalink.